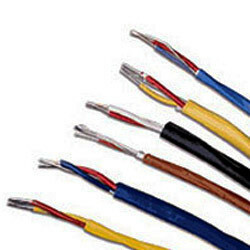 Manufacturer & Exporter of Thermocouple Wire. Our product range also comprises of PTFE Hook Up Wires, PTFE Cables and Thermocouple Wire. We offer PTFE Thermocouple Wires that are fabricated from premium raw materials like ni, cr, al, iron constantin, copper Constantin, NICR Constantin etc. Our range follows DIN - 43760 standards. For accurate temperature measuring and regulations, our range is made in twin flat or round form and thermocouple leads are used. we offer customization facility.